Let us be fungus free! 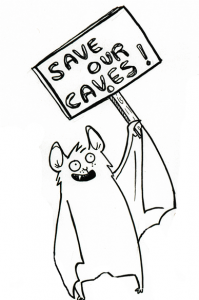 One of Artist Kim’s bats would like people to get serious about saving the caves. Hi everyone! I hope you all had a good week! I read an article that I thought was important about trying not to spread WNS from cave to cave. As you know, WNS has been found in the Pacific Northwest. They are desperately trying to stop it from spreading. Since a lot of people go out and explore the outdoors on Memorial Day weekend, authorities would like to remind everyone about the dangers of white-nose syndrome and what we can do to help fight its spread. Since WNS can be carried from one cave to another by pets, other animals and humans, everyone is being asked to follow some very specific rules. The people who manage the Deschutes National Forest are specifically trying to protect Lava River Cave. They are saying that nothing that has been used in any other mine or cave is allowed to enter Lava River Cave. This includes clothing, shoes and gear. People are also being instructed to clean and disinfect items before going into any other cave or mine after Lava River Cave. I know it sounds like a lot, but it’s really important for the bats that everyone follows their rules. Bats are very important to our environment and they need our help. So, if you are planning on visiting Lava River Cave in Oregon, or any other cave, please follow the rules mentioned in the article. The little bats are counting on you.